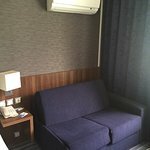 My wife and I stayed 2 nights at the Holiday Inn Express in Lisbon in May 2017. We are IHG platinum card holders and the stay was booked on points. 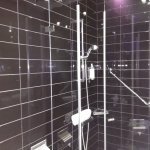 Our original plan was to stay at the InterContinental but it was out of reward nights, so we chose this hotel which ended up being a great choice. 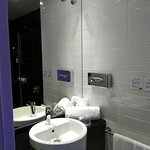 As the pictures show, the hotel is in a beautiful building, has a very modern interior with clean and functional rooms. The breakfast is great and staff were helpful. 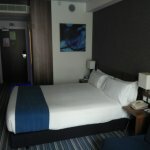 I'd easily say this is one of he nicest Holiday Inn Express hotels I've ever stayed in. It is a great place to call home during a few days in Lisbon. Thank you so much for your review of our hotel. I am pleased to hear you enjoyed your stay with us. It's something our staff takes great pride in, so we value your feedback. The price you found is 19% lower than this hotel's average rate of $221/night. The price you found is 37% lower than this hotel's average rate of $265/night. This is a very regular budget hotel, besides it is located in a nice historic building amd I looked modern can't say anything positive. 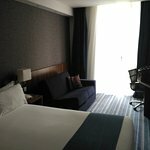 No "do not disturb sign"
All in all very spartan hotel which would deserve 2* but gave 3 because it looked nice and updated! My preferences were not met and even if I changed the room, it was exactly the same. The receptionist told me that all rooms were the same, but was not true! I asked for a quiet inner room but did not get one. It was a quick one night stay and I didn't really use the hotel for anything else but sleeping, but I would not return, especially for the price paid which was very steep for that type of accommodation. Thank you for your feedback regarding your recent visit at our hotel and please accept our sincerest apologies for the disturbance you have experienced during your stay due to the room conditions. Rest assured that these issues will be looked into. We value your comments and welcome the opportunity to serve you again. The place was updated but the rooms felt sad and gave off motel vibes (US visitors will know this). Overall - there are better options. 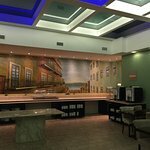 The hotel is situated close to Ave Liberdade shops on one side and about 15 mins walk to the beginning of Bario Alto on the other side. No public transportations close by nor convenience stores. The common area was fine - nicely modern and updated. The first room we were placed in was right by the stairway (even though a super quiet room was requested) and we found that one side of the bed was broken (super squeaky noise getting in and out). We had to call someone to come up. The girl tried to say nothing was wrong with it at first. Only after strong push back, she relented and said will look to see what else is available. My partner went down with her. She kind of got chewed out by the other senior girl for letting us have another option. Finally we were placed in the ground floor room. For the vibrancy of Lisbon, the rooms were stark and gave off the feeling of nursing homes. There were no safes in any of the rooms. The shower was tight and of course, there was water everywhere once done. Whenever we asked for directions or tried to figure out rail stations and such, we found out all the instructions were off - and this was with several people. All in all, not recommended and your money could be better spent elsewhere. We've stayed at this chain previously and haven't been disappointed , this hotel was no different, indeed it's one of the best. It's an older building which has been re designed to a very good standard. 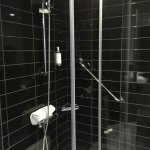 Location is great , only a few minutes walk from subway which connects to the airport and likewise very close to the area where the tourist buses leave from. Avenue Liberdade is a lovely walk with lots of high end designer shops. Plenty of restaurants within walking distance and the main area of the city is about a 15 - 20 min walk away . Room was lovely with a great shower. Breakfast is standard Holiday Inn Express but is more than enough to start the day. 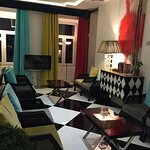 Lisbon is a lovely city and if we return I would probably book this hotel again. Thank you so much for your review of our hotel. I am pleased to hear you enjoyed your stay with us. It's something our staff takes great pride in, so we value your feedback. We stayed 4 nights. Nice clean rooms, comfortable bed. Decent breakfast. Location is fantastic. Walk distance to City center although you might say that all the Lisbon is center itself. The only thing we missed in the hotel was the fridge. We strongly recommend the Hotel. Room tip: Street of Lisbon can be very lively so if you have street view rooms it can be a problem for somone having problem getting asleep. It's very important to us to hear such a great review. We hope you visit us again with the promise our standards will be the same. Thank you so much for taking the time to write such nice compliments about our Hotel. It really means a lot to us that you enjoyed your stay with us and our excellent location, nice rooms and decoration, great breakfast and overall experience and services provided by our staff. We hope to have the opportunity to welcome you back at the Holiday Inn Express Lisbon Av. Liberdade.